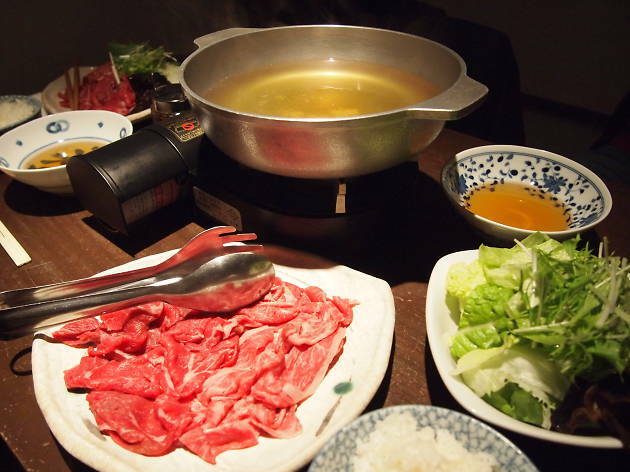 Halal wagyu, that mythical thing, actually exists – and it's served up as shabu-shabu at Hanasakaji-san in Shibuya. The meat is sourced from Miyazaki in Kyushu, where one of the few halal butchers in the country works his magic on the beef before sending it to be served in rather tasty form here. The nondescript entrance (we walked straight past it) belies its interior, which is quite a bit more upscale; as is probably the case for most good shabu-shabu or yakiniku, come here only if you have a bit of cash to splash. The seating is a mix of private tables and a counter: either one is a good pick, although opting for the counter gives you the chance to see the chefs in action up close. When we visited, there were two halal shabu-shabu courses: one small shabu-shabu set alongside a bento filled with a variety of dishes (tempura, seafood salad, grilled mackerel and more), and another with only shabu-shabu. The flavours were bang on (it's hard to mess up shabu-shabu, to be fair, unless you extremely overcook your own meat), and portions were just right, although big eaters might want to order a bit extra. 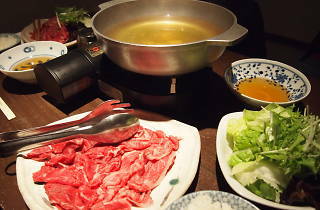 Sets go for ¥4,000-¥4,500 at dinnertime, while meals consisting of three or more courses are available from ¥8,000. No alcohol is served, and all non-halal ingredients are outlawed from the place. Hanasakaji-san remains a safe bet, whether you're looking for halal shabu-shabu or just an upscale washoku dinner.